Last week I had one mission, to find the best birthday present I could for my loverly food partner. One store I had in mind for a probable gift was Williams-Sonoma, I will always be a sucker for W-S, which took me to Time Warner Center. I didn't find her a good gift, but I couldn't resist the magnet pulling me upstairs, Bouchon Bakery. My recent disappointments with Bouchon are well-documented here and here; had this visit resulted in another letdown, I decided I wasn't going to return for a while. When I arrived in the late evening, many popular pastries were still available, including the Sticky Buns, TKOs, and Nutter Butters, leaving me with an agonizing decision. 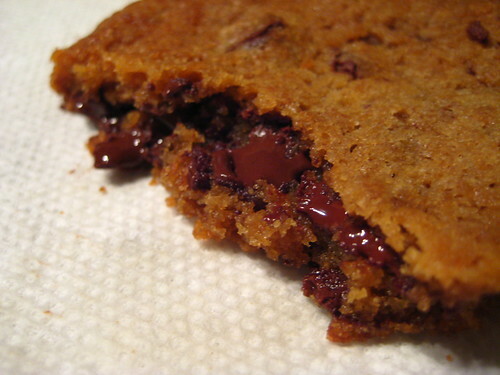 I was in the midst of a rough emotional week, I sought comfort, an edible hug-I bought a chocolate chip cookie. 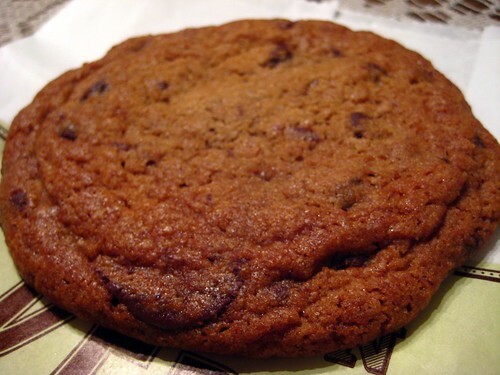 Bouchon's chocolate chip cookie has routinely been talked up, both Dessert Buzz and Food in Mouth found it to be notable, if not among the bests in New York. I got my cookie, placed it in my bag, and headed home with a plan to eat it warmed. This is a good sized cookie, easily-and probably should be-split between two people. It was strong enough to survive the commute home, yet soft and chewy even before warming. The outer cookie ring was just crunchy enough to give the cookie shape and support the weight of the chewy, almost under baked inside. Yes, this cookie is almost pure dough, and is made with a good amount of butter and brown sugar. The chips are well-dispersed throughout the cookie, big enough to savor, but small enough that they don't ooze everywhere when melted. I wouldn't say this is the perfect cookie, I'd prefer one with a little less butter, and a tad firmer, but this is definitely-DEFINITELY-on the list of top cookies. It's amazingly delicious. And I will be back. Looks delicious! 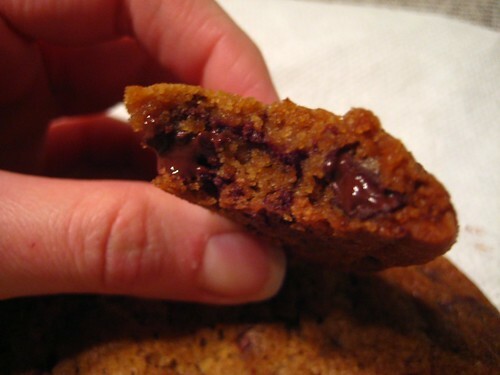 Between Bouchon and Torres, who has the upper edge on chocolate chip cookies?